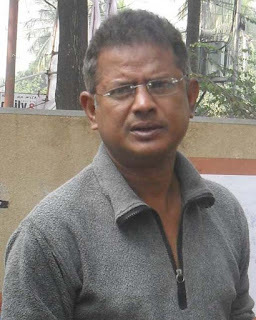 Ahsan Habib is a Bangladeshi cartoonist, writer and editor of Unmad, a satire magazine. Habib was the third son of Foyezur Rahman and Ayesha Foyez. His father, a police officer, was killed by the Pakistani army during the liberation war of Bangladesh in 1971. His elder brother, Humayun Ahmed, was a writer and film-maker. Another brother, Muhammed Zafar Iqbal, is also a writer and educationist. Habib is married to Afroza Amin and they are parents to only child Shabnam Ahsan. Due to his father's occupation, Habib spent his childhood in different parts of Bangladesh - Jagdal, Panchagarh, Rangamati, Bandarban, Chittagong, Bogra, Comilla and Pirojpur. Habib studied in more than eight schools before the SSC exam. He earned MSc degree in geography from the University of Dhaka. Habib started career as a cartoonist and writer. He is the editor of Unmad, a satire magazine running since the early 1980s. He was the editor of the Bengali science fiction magazines, Moulik, Autoline, and Ghuddi. He is an adviser of Bangladesh Cartoonist Association. As a cartoonist, Habib designed many covers. In 2015 he join as a professor of Daffodil International University in graphics designing. He also worked on writing Sher, a short witty 3/4 lined satiric poem, mainly found in the Indian Subcontinent.